The season of mists and mellow fruitfulness is here. Summer is over, the kids are back at school it’s a great time to take stock of your health. Whilst some studies show that most of us only gain a small amount of weight whilst we are on our summer holidays my experience is that most people who find it hard to manage their weight generally do gain a significant amount. If you’ve gained more than a couple of kilos don’t let it get you down but don’t just shrug it off either. Here are my five reasons to tackle weight gain in autumn. “Creeping obesity” which is a rather miserable sounding term for gaining weight following festive seasons or events and then failing to lose it repeatedly, is a big problem. If you gain 1kg each summer after 7 years that’s over a stone in ‘old money”! Yikes. Whilst we don’t want to get obsessed about our weight we don’t want to get to a place where we need to go on a major mission to get back down to a healthy weight. To make matters worse the Christmas festivities start in November these days and we tend to gain a bit of weight then too. So a kilo over the summer then another one or two over the Christmas festive season. It all adds up. Tackling your summer holiday weight gain in autumn will give you some “wriggle room” to manage the long Christmas festivities when they hit you in November. I am not saying lose weight now and binge for 2 months. Yuk! There are so many things you can do to avoid totally over-doing it at all the Christmas parties and family dinners. The reality is that many of us gain weight over Christmas so you just don’t want to compound the problem. I will post in November on managing the festive season so look our for more tips then. Once the cold weather sets in you may find yourself choosing to drive more rather than walk or cycle. Going out in the cold to the gym or the pool may seem less appealing. Many people find it easier to get back on track with their weight whilst the weather is still reasonable and they can do more exercise. As the weather changes you might be thinking about investing in a few new pieces for your winter wardrobe. You don’t want to buy things that are too small or to buy a size up and end up looking like you’re wearing a tent once you get back on track. Getting your weight in check in that “in between time” will mean you can buy your usual size and have it fit you well when the cold weather hits. 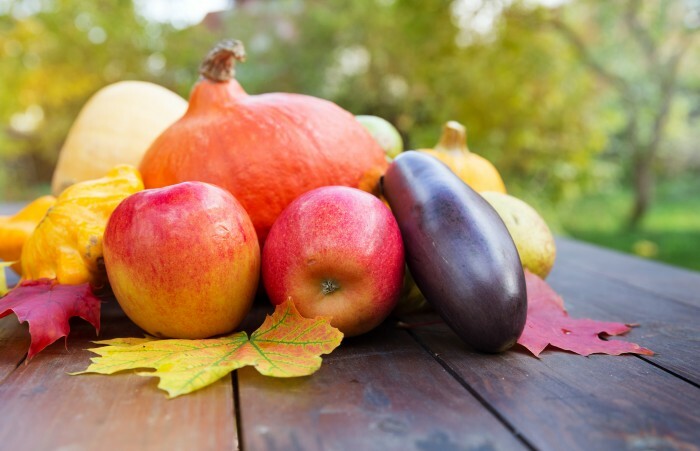 In the UK autumn is a great time for fruits and vegetables. Covering half your plate with salad or vegetables is a fantastic way to keep the calorie content of your meals down and ensure that you get a wide range of nutrients at the same time. Here a few great fruits and veggies that are in season right now in the UK and some ideas for how you can include them in your meals. Butternut squash – makes great soup or chop into cubes and add to meat based dishes to bulk them up and reduce the amount of meat needed. Cabbage – don’t just boil it up and serve at as a side school dinner style. Try shredding it and add it to stir-fries. Carrot – great in so many different cuisines. I include carrots in tagines and oriental dishes as well as stews and bolognese. Hopefully that’s inspired you but if you need a bit of extra help do get in touch and arrange a consultation. This entry was posted in Eating Mindset: Get Real Tips, Seasonal weight gain and tagged autumn, healthy weight, losing weight, seasons, weight by Stephanie.fade. Bookmark the permalink.